Thomas was born at Maidenhead in 1846 to plumber John Medd (1809-1881) and Hannah Elizabeth Medd neé Worrall (c.1813-1892). ‘Swan’ was his paternal grandmother’s surname. Thomas followed in his father’s footsteps and became a plumber. The family moved from Berkshire to Middlesex, first to Islington and then to Twickenham. Thomas married Emily Ann White (1843-1893) on 30 March 1874 at Holy Trinity, Twickenham. Emily, born at Corfe Castle, was then in domestic service in Twickenham as a cook for retired shipowner George Louthean. She had previously been in domestic service as Cook for James Kent of Lynch Farm, Kingston. After their marriage, Thomas secured employment at Kingston as estate plumber. Thomas and Emily had seven children (see later), all born at Kingston. By 1880 Thomas, in addition to being a plumber, had become Kingston’s postmaster and grocer. Thomas served as postmaster for over 35 years. Emily died in May 1893 aged 49 and Thomas died in January 1919 aged 72. They are buried at Kingston in unmarked graves. Eleanor was baptised on 14 March 1875 by Rev. Spencer-Smith. At the time of the census in 1901 Eleanor was employed as a clerk in the Kingston post office. She married Charles Willie Ernie Orchard (1878-1955) at Kingston on 6 April 1908. They had two children, Kenneth Charles ‘Ken’ Orchard (1910-1965) and Emily Joan ‘Joan’ Orchard (1912-2010). After her father’s death, Eleanor, also known as ‘Nell’, took over as postmistress and later her daughter Joan succeeded her. Hannah was born at Kingston and baptised by Rev. Spencer-Smith on 18 June 1876. Hannah married telegraph engineer Augustus Walshe (1873-1963) at Kingston on 28 July 1909 and the service was conducted by Rev. Spencer-Smith. Hannah and Augustus had two sons, Thomas Askew Walshe (1911-1972), who became a postman at Shepton Mallet in Somerset, and John Donald Walshe (1913-1981), who was shot down in the early years of World War 2 and spent many years as a Prisoner of War after which he worked for a glove manufacturer. 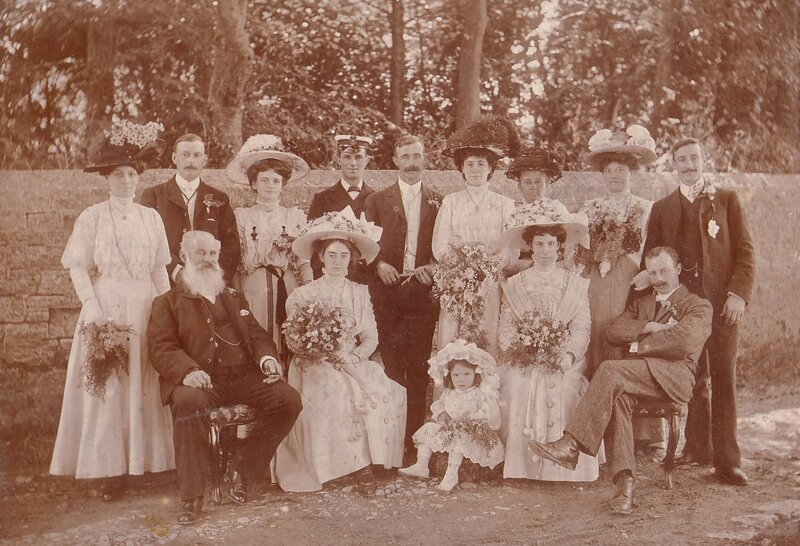 The wonderful photo above has been provided by Sandra Walshe, grand-daughter of Augustus and Hannah, who says “Family tradition has always been that Augustus and Hannah were the first couple to be married in the new church, while Hannah’s older sister Eleanor Medd was one of the last brides at the old church, when she married Charles Orchard in 1908”. John was born at Kingston on 9 September 1879. When he joined the Royal Navy on 3 September 1901 he gave his occupation as Fitter / Turner. H. John married Rose Cains (1882-1969) at St. James’ Church, Poole on 3 September 1904. His older sister Eleanor was a witness. John served onboard Lion Class battle cruiser H.M.S. Princess Royal as an Engine Room Artificer for the duration of World War 1. His conduct throughout his 22 year naval career was always rated ‘Very Good’ being awarded the Good Conduct Medal. In 1920 Rose was living at 18 Tottenham Road, Kingston, Portsmouth. John died at Portsmouth in 1968 and his widow Rose died there the following year. James was born at Kingston in 1881. 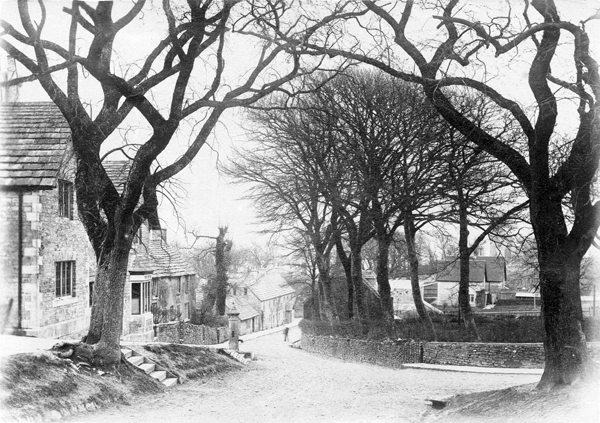 In 1901 James was a blacksmith boarding at 1 Mill Pond Cottages, Swanage. In World War 1, James served with the 1st Battalion of the Dorsetshire Regiment but sadly was killed in action at The Somme on 20 August 1916. He is buried at Blighty Valley Cemetery and he is commemorated on the memorial plaque inside Kingston New Church. Bessie was born at Kingston in 1883. In 1901, Bessie was in domestic service as a cook for retired estate agent Frederick Jackson at Gwyle, Beach Road, Swanage. Ten years later, she was still in domestic service as a cook, but this time she was at 26 Gloucester Place, Portman Square, London and Bessie completed the census schedule in householder Mrs. Van de Meyer’s absence. On 7 August 1912 Bessie left the port of Bristol on board the Royal George. The ship arrived at Montreal on 14 August 1912. Bessie’s destination was Ottawa where she intended to be a housekeeper and cook. On 3 June 1916, Bessie married carpenter Lorenzo Archdale Murphy (1868-1935) at Carleton, Ontario, Canada. Lorenzo died in 1935 and Bessie remained in Canada. Lit was born at Kingston in 1884. She died in July 1906 aged 21 and is buried at Kingston in an unmarked grave. Arthur was born at Kingston in 1886. By 1901 he was a postman. Arthur enlisted for World War 1 on 29 October 1914 when he was living at 1 Cromwell Villa, Oxford Road, Bournemouth. He served with the Royal Garrison Artillery initially as a Gunner, then as a Bombardier, Corporal and Sergeant. On 3 August 1918 Arthur married Lizzie Campany (1885-1926) at Christ Church, Ore, Hastings, Sussex. Arthur was demobilized on 19 August 1919. Arthur and Lizzie had one son Arthur Thomas Medd 1920–2006. Lizzie died in 1926. Two years later, Arthur married Florence Myrtle Purver (1896-1951). Florence died in 1951 and Arthur died in 1967. If you have any further information, memories, photographs etc. about the Medd family then please get in touch with us.